A 15 run game 3 offensive explosion led MSU to its first SEC sweep of the year at Texas A&M and second straight series victory. The fact that this sweep came on the road makes it even sweeter. MSU’s offense seems to be coming to life led by a huge weekend for Hunter Renfroe where he got his season HR number to 13, which is tied for the SEC lead with Mason Katz (LSU). Not only did our bats come alive but the pitching was stellar as well. MSU only used 5 different pitchers the whole weekend including a complete game effort by Kendall Graveman on Saturday. I admit that I’m not a baseball genius and I leave the game breakdowns to guys like Todd4State. I do like to look at stats and where we sit as those things give great insight to our season and where are headed. Just looking at that quickly you have to be ok with where State is sitting. If we finfish like we are capable of I think 2nd is our spot and very well could get us the coveted regional host. LSU is on fire and looks almost invincible with their overall record of 34-3. Makes the fact that we outplayed them and lost the series tough, but encouraging at the same time. 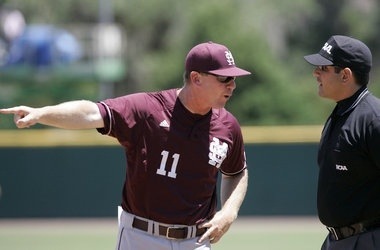 MSU has a chance to continue the momentum going forward with a series against Auburn on deck for Super Bulldog Weekend. Auburn is struggling right now and another sweep would be huge for the Dawgs. If you want to look ahead, we have a tough trip to Vandy after Auburn. Getting 1 in Nashville is almost a must and if we could figure out how to get that series, my wool growth will be thick. After Vandy we close out with 3 winnable series: Bama, at Ole Miss, and ending with South Carolina at home. There are 2 non-conference games sandwiched in there against Memphis on the 23rd and Oral Roberts on May 14th. The discussion becomes what record is required for us to host? I’m hoping for 11 more conference wins which would get us to 19-11. I’ve read others suggest that 18-12 would do the job as well. I’m keeping my fingers crossed. Another thing that is a solid indicator of what type of season you are having is your team statistics and where you stack up in the league. These numbers are courtesy of Coach34 at EliteDawgs.com . I could have researched this myself but copy and paste was too easy. All in all I don’t think anyone can complain about where MSU baseball is right now and the direction we are headed. At the beginning of the year the goal was to host a regional and that is very possible right now. The guys seem to be hitting their stride at just the right time. It will be fun to watch this play out. This entry was posted in Sports and tagged Baseball, John Cohen, MSU, SEC. Bookmark the permalink.